This post was originally published on September 8, 2009 when Hi-Rise was still located in Harvard Square and the Mass Ave location was non-existent. Enough has changed that I felt compelled to update the post a bit and add some photos that I never got around to adding in the past. I have basically kept the text of the original post, staying true to what I wrote back then (admittedly, my writing has morphed over the years!). Please enjoy! I love, love, love this place. They make the most incredible vanilla loaf. 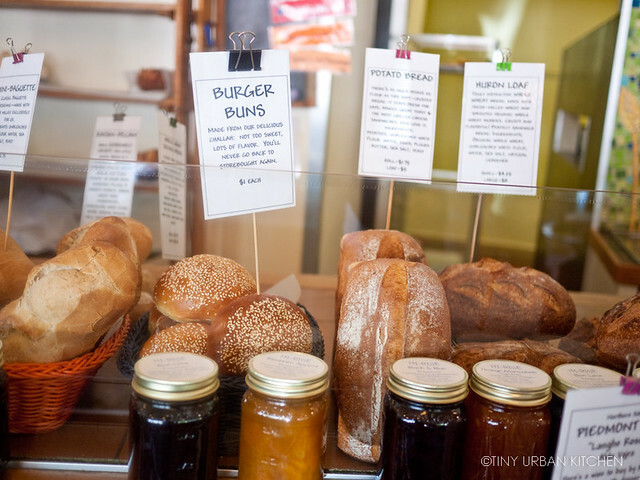 Their sandwiches are amazing, and the bread – oh the bread! 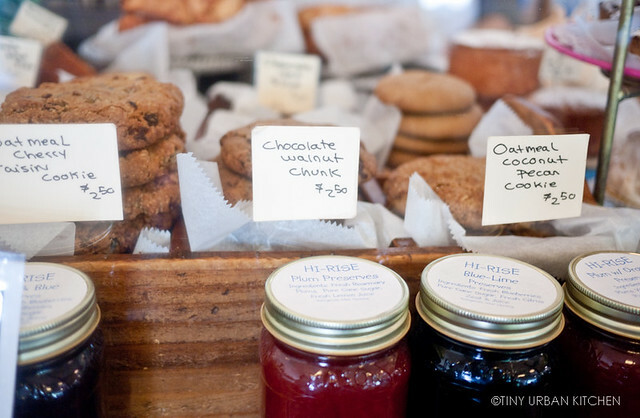 Hi-Rise Bread Company is a bakery in North Cambridge, not far from the ever-so-famous Formaggio Kitchen that Julia Child liked to frequent. 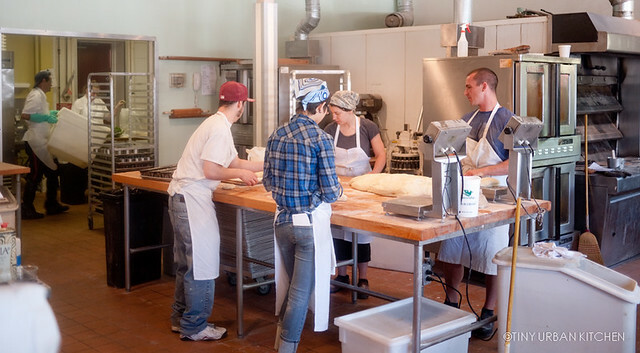 Half of the space is actually devoted to bread making. 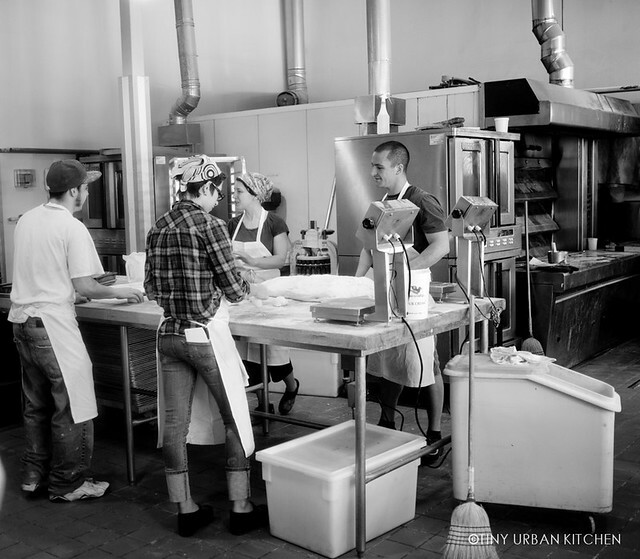 You can watch bakers scurrying around a HUGE table where other bakers are rolling out dough. 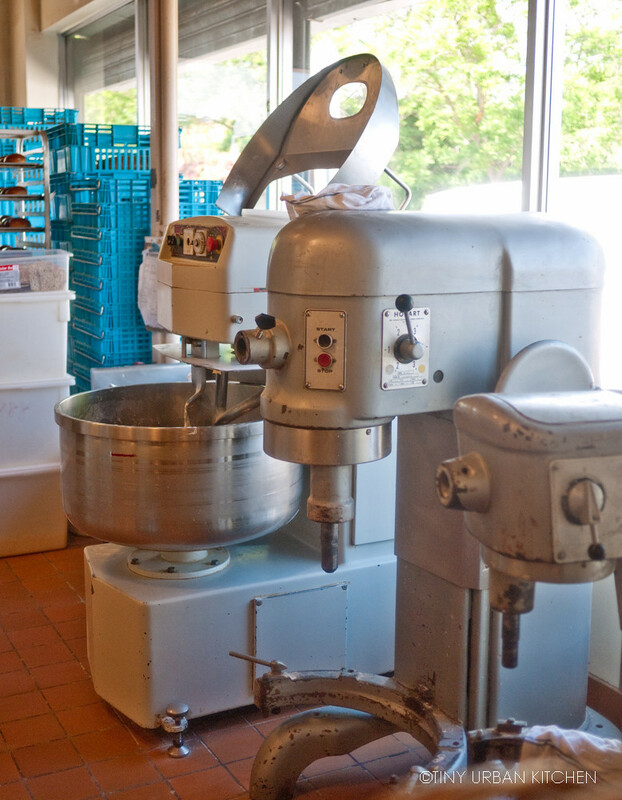 And, if you’ve never seen a stand mixer that stands taller than me (OK, I’m not that tall, but STILL! ), then you should definitely come and take a look. Anyway, aside from the fun of watching bread being created, you can order scrumptious sandwiches, good coffees, and amazing baked goods. Every sandwich I’ve tried here is good – it’s hard not to like the amazing fresh bread with which the sandwiches are made. You can even get a sandwich made with cornbread! My favorite baked item is the vanilla loaf (recipe here!). It’s dense, sweet, and has an incredibly crumbly crust that is to die for! If you go, ask for an end piece. They taste better. Mmmm check out the gorgeous crust. The sugar crystallizes a bit on the edges while baking, which gives this loaf an amazing slightly burnt sugar buttery kind of crusty edge. It’s hard to explain, but it’s really good. I guess there are a few negatives. The prices are a bit high. Sandwiches run around $10-$12 each and a slice of that heavenly vanilla loaf will set you back several dollars ($17-$18 for the entire loaf). It is also hard to find seating. There is basically one long table in the middle with benches on either side. There are also 2-3 small tables along the window that each seat about 2 people. Especially on weekends, you probably will have to stand and wait for a seat to open up. For more seating, another option is their 1663 Mass Ave location, between Harvard and Porter Square (right near Harvard Law School). There are several tables, barstools facing out the window, and several outdoor seats, which is a really fun place to hang out during the summer. Although you can’t see the crazy ginormous stand mixer and the bakers running around, you can still enjoy a limited selection of the great sandwiches while sitting outside in Harvard Square. It’s actually one of my favorite places to go for lunch on a nice day. Plus, they sometimes offer these cute mini-sanwiches. In any event, definitely check this place out and try the vanilla loaf! amanda hesser in her cooking for mr. latte bk has a recipe for those very same loaves (&she went on & on about how yummy they are from hi-rise). now i’m curious & will try it out – but – how incredible can vanilla loaf be??? Thickly butter two loaf pans and preheat oven to 325 farenheit. Scrape the first vanilla bean and get all the seeds into the bowl, along with the vanilla extract. Add the eggs one by one and beat to combine. Sift the flour, salt, and baking powder. Add the dry ingredients to the batter and fold in, mixing minimally with a rubber spatula, until just combined. Divide the batter between the loaf pans. Bake for 30 minutes, then turn the pans and bake another 25-40 minutes or until a cake tester comes out almost clean. While the loaves bake, make syrup. In a small saucepan, dissolve the sugar in the water over medium heat. Add the vanilla beans and seeds and stir a little to loosen the seeds. Remove pan from heat. When the loaves are done, cool them for 10 minutes in the pan on a rack, and then turn them out onto the rack. Brush them generously on all sides (bottom too) with the syrup. Repeat the brushing with syrup a few more times as the loaves cool. Amanda Hesser says the cakes can be wrapped and frozen, but as she cautions, it’s hard to wait that long.